The fin is produced by being rolled from the wall of the tube and is therefore integral with the tube itself. 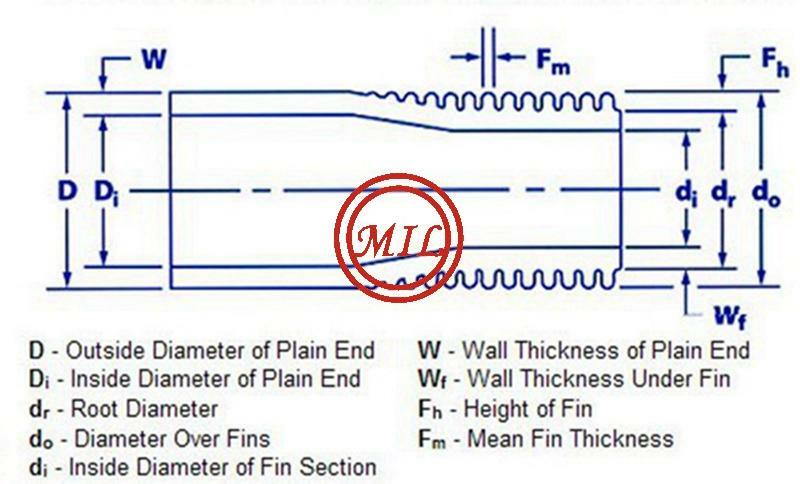 Due to fin rolling the wall thickness beneath the fin section is reduced compared with the plain ends. The bore of the fin section is slightly reduced. Most tubular materials can be finned, however hardness of the material usually determines the finning code or fin profile. Harder materials such as stainless steel, nickel alloys and titanium are usually supplied with a greater fin density (28, 30 or 36 fins / inch). This shallower fin profile reduces work hardening of the material and helps eliminate the possibilty of fin root cracking. Softer materials such as carbon steel, copper and copper alloys are usually supplied with a deeper profile giving a lower fin density (16 or 19 fins / inch). Plain ends and any skipped sections must be specified. Finished tubes can be U bent if required. The U bend area can be either finned or plain, to meet the required specification. 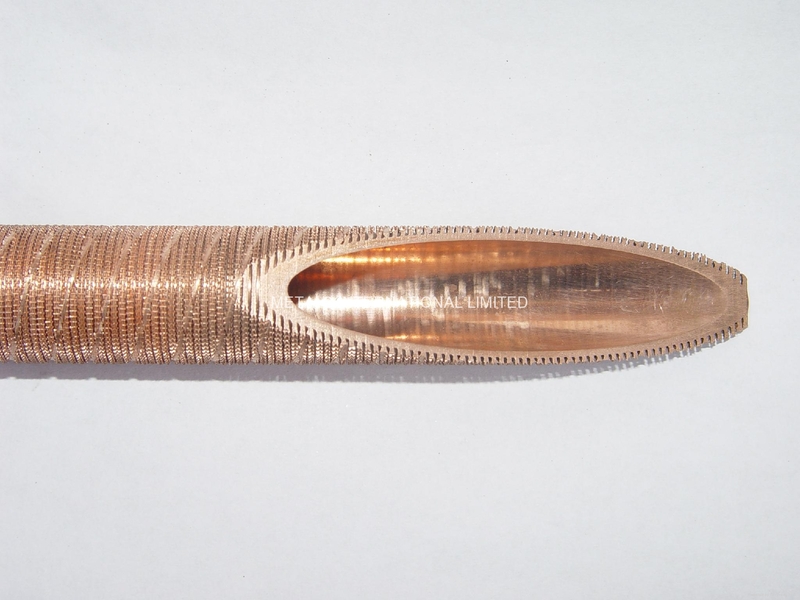 Monometallic finned tube with fins drawn from the parent metal of the tube. 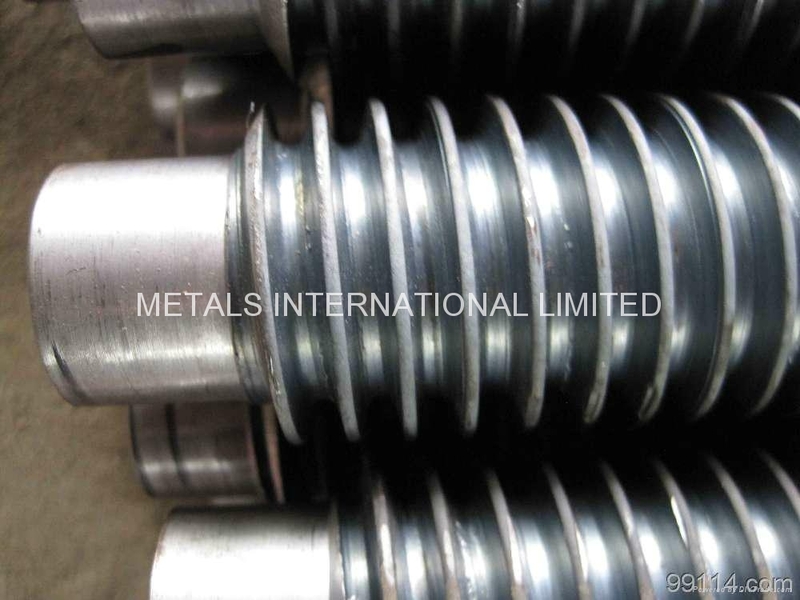 All monometallic Tubes are using a cold rolling or ribbing process. Materials: Aluminium, copper, brass, cupronickel, carbon steel, stainless steel, titanium, etc. FPI: 12, 16, 19, 28, etc. Aftercoolers, air coolers, air heaters, charge air chillers, condensers, convection heaters, electric heaters, evaporators, fluid coolers, gas coolers, heat pipes, hydrogen coolers, industrial tumble dryers, intercoolers, immersion heaters, oil coolers, radiators, refrigeration, solvent recovery and steam to air heat exchangers. Finned tubes provides 2.5 to 3 times the external surface area of bare tube, which yields numerous benefits for the heat transfer equipment. Reduced pace, weight & structural savings in compact heat exchanger is valuable. The more expensive the tube material, the more dramatic the cost savings for corrosive service. Proper material selection can eliminate costly downtime & maintenance. Coastal refineries using once-through seawater cooling systems can benefit by substituting conventional copper nickel tubing with Titanium finned tube, Titanium finned tube is highly resistant to seawater corrosion erosion. The extruded fin tubes are produced by compressing an aluminum tube, or sleeve, onto the base tube. The bloom is exposed to very high pressures which essentially "grows" the fins into the final fin profiles.This process manufacture an excellent strong joint with great resistance (fin stiffness) as well as exceptional heat transfer capabilities (longevity, temperature range). The advantage of extruded fin tubes are full protection of bare tube against corrosion and fin has high mechanical strength. Extruded finned tubes provide the most stable performance over time as compared to the other fin types. The fin is rolled from an outer aluminum tube by a process using pressure to create a rolled "pressure bond" between the liner tube and fins. The aluminum fin material completely encloses the tube, except at the ends where a tube coating can be applied. Primaily extruded finned tubes are used in high temperature conditions and corrosive atmospheric conditions, such as operating temperatures less than 300°C or off-shore applications,heat pipes air to air heat exchangers for HVAC applications,air dehumidification in air treatment plants, energy recovery in air exaust system. This kind of fin design is the least economical as compared to the other fin types, main reason due to the increased amount of aluminum used around 40% also increased labors during the manufacturing. However this increased cost can be compensated if using lower grade parent tube material. 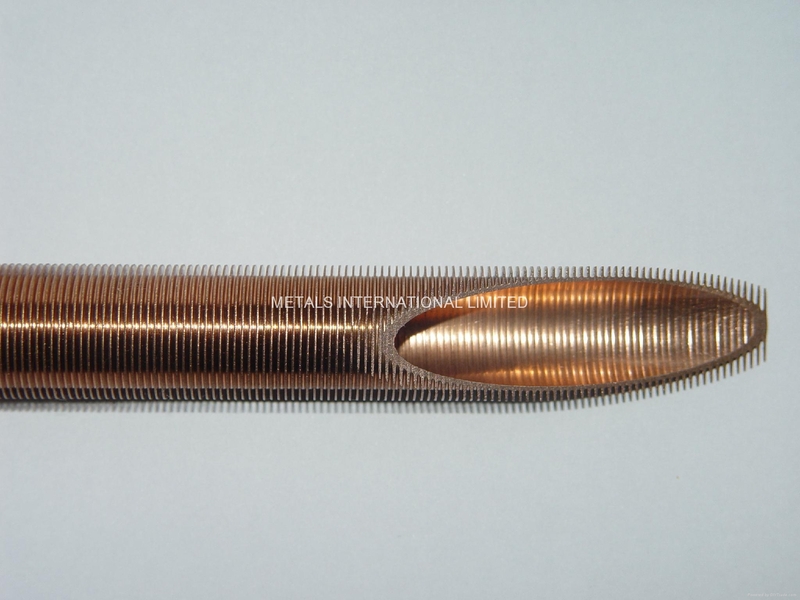 Specifications︰ The fin tubes available with us covers Integrated Finned Tube of Copper (C10200, C12000, C12200), Cupronickel (C70600), Aluminum (1060) and Aluminum Alloy (AISI6063), Bimetallic Finned Tube such as Copper - Aluminum, Copper Alloy - Aluminum, Steel – Aluminum, Stainless Steel – Aluminum, Laser Welded Fin Tube using Stainless Steel and Titanium. The interior surface of finned tube can be plain or undulated or grooved according to customers' request on different heat exchange efficiency. Besides, the shape of finned tubes can not only be in straight, but also after soft annealing in Omega shapes, coils, or customized shapes catering to customers' needs. Finned tube is composited with iron-aluminum or copper-aluminum tube rolling out the fin, which feathers are tightness, small heat resistance, good heat transfer performance, high strength, small flow losses, strong corrosion resistant performance, not easy to deformation and a long working lifetime in cold and hot condition,etc. Overall rolling fin is smooth and has no burr, so it is easy to clean. It is easy to make the fin surface wet and cooled with water when makes it cold during heating air-conditioning engineering. In the situation with drying, heating and other heat exchanging, its surface is handles by anodizing, which with beautiful color and luster, and can effectively prevent surface corrosion. Aluminum rolling finned tube is rolling as a whole by the aluminum tube, which has the feather that no contact thermal resistance, high strength, thermal shock and mechanical shock, good thermal performance, and considerable expansion heat transfer surface. The heat exchanger with this kind of finned tube is ahead of the string or around the plate ones. According to user needs, we can produce all kinds of steel strip winding finned tube and steel aluminum composite finned tube. 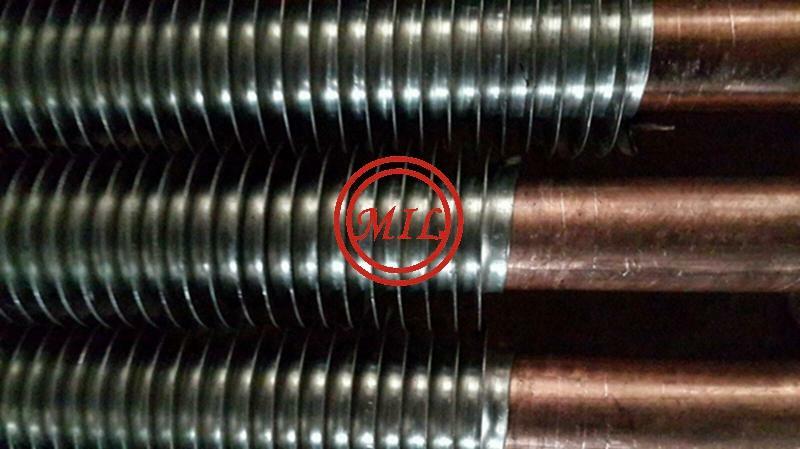 As the heat transfer element finned tube works long-term in high temperature and flue gas condition, such as finned tube in the boiler heat exchanger which use conditions are as high temperature and high pressure and corrosive atmosphere, should have a high performance metrics and they are as follows:Anti-corrosion ，Anti-wear，lower contact resistance ，Higher Stability，Anti-dust stratification. T fin tube is a kind of high efficient heat exchange tube that is made by rolling processing and molding of the light pipe. Its structure characteristic is forming a series of spiral ring T tunnel on the outside the pipe surface. The medium outside the pipe forms a series of bubbles in the tunnel nuclear when heated. And because the tunnel cavity is in a heated state, the bubble nucleus rapidly expands and increases the inside pressure rapidly by continuously heating, then erupts from a crack in the pipe surface. There is a strong flush power and a certain negative pressure with the bubbles erupting, and which makes the low temperature liquid flow into the T tunnel forming the constant boiling. This way of boiling sends out the heat is much large than the light pipe in an hour and an surface square, so T-type tube has the higher ability of boiling heat transfer. (1) Good heat transfer effect. The coefficient of heat boiling is 1.6~3.3 times higher than the light tube in the R113 working medium. (2) Only when the heat medium temperature is higher than the boiling point of cold medium or bubble point is 12℃ to 15℃, the cooling medium can bubbly boils in a regular light tube heat exchanger. Instead, cold medium can be boiling When the temperature is just 2℃ to 4℃ in the t-shaped fin tube heat exchanger. And the bubbling is close, continuous, and rapid. So the T-type tube forms the unique advantages compared with the light pipe. (3) With CFC 11 for medium single-tube experiment showed that the boiling up heating coefficient of T-type is 10 times of the light pip. For small bundles of liquid ammonia medium experimental results that the total heat transfer coefficient of T-type tube is 2.2 times of the light pipe. The reboiler industrial calibration of C3 and C4 hydrocarbon separation tower shows that , the total heat transfer coefficient of T-type tube is 50% higher than the smooth tube in the low load, and 99% higher in the heavy load. (4) The pipe price of this kind of porous pipe is cheaper. (5) It is not easy to scale both within and outside the tube T tunnel slot surface due to the fierce disturbance of internal gas-liquid and seam gas quickly jetting along T high, which ensures the equipment can use for a long time and the heat transfer effect is not affected by scale. Due to the features that higher heat transfer coefficient, larger heat transfer area and less consumption of steel etc, Threaded pipe has been recognized as a kind of strengthening heat transfer element. The research report pointed out that the design of is reasonable. So the flue gas heat transfer efficiency of threaded pipe is 1. 6 times of light tube. 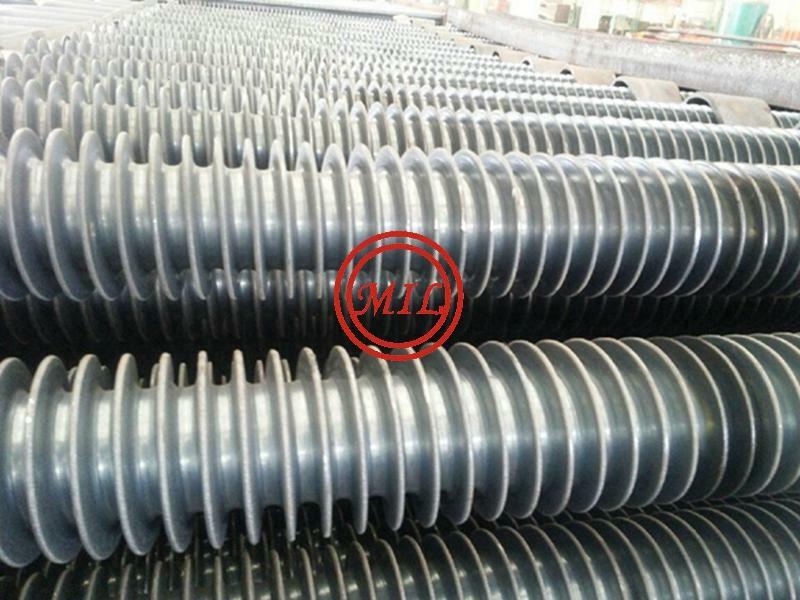 Because the threaded pipe has the remarkable characteristics, it has been more and more widely used in boiler manufacture. (1) The heat transfer of a thread smoke tube is as the same as that of 1.7 to 1.8 root ordinary pipes after application of the optimization of heat transfer and flow resistance when it is used on the boiler. This not only can reduce the pipe numbers, but also can lessen the diameter of the pot shell, thus, to save the steel and to cut down capital. (2) The heat transfer surface area is 1.5 to 2.0 times of the light pipe, this greatly improves the activity of the cooling methods and strengthen the tube inside boiling and condensation transfer effects in the application of air conditioning refrigeration industry. （3）Setting up in heat exchange equipment application on decoration, steel or stainless steel tube through a molding machine rolling, spiral tube fouling are spiraling in appearance, set decoration equipment running line temperature changes make the pipe produces expansion and contraction, thus can make the dirt to fall off; For the cylinder and the light pipe scale layer, without the power off.